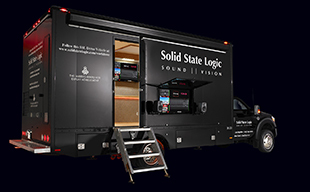 SAN FRANCISCO, CA  At AES, Solid State Logic demonstrated the latest generation of the market leading C100 HD Digital Broadcast Console Range. The C100 HD-L was showcased with the new BlackRock processor system and accompanying RIO modular I/O rack. The C100 HD, C100 HD-S and the new C100 HD-L Consoles, along with a full range of routing and I/O options via the CS-B Stage Box and/or MORSE, are designed to fit installations from smaller market local stations and mobile trucks to national broadcasting facilities. BlackRock is a new miniaturized version of the industry proven SSL Centuri Processing Core that reduces the size of the rack enclosure to a compact 2U. The new accompanying RIO I/O reduces the size of the Centuri I/O enclosure to an extremely efficient 7U. BlackRock & RIO further enhances the appeal of the C100 HD-S and C100 HD-L consoles to mobile broadcasters and space conscious installers. BlackRock delivers these remarkable space savings through the use of new CPCIe card based DSP processing cores, which provide a minimum sustained audio processing rate of 32 GFLOPS of processing power per core card. SSLs optimized audio algorithms can achieve up to 53 GFLOPS per Blackrock core enabling SSLs proven software environment and unrivalled audio processing capabilities to be sustained in this compact format. Extremely reliable, cost effective, and scalable solution for sharing audio I/O and managing related control data in multi-studio broadcast facilities.